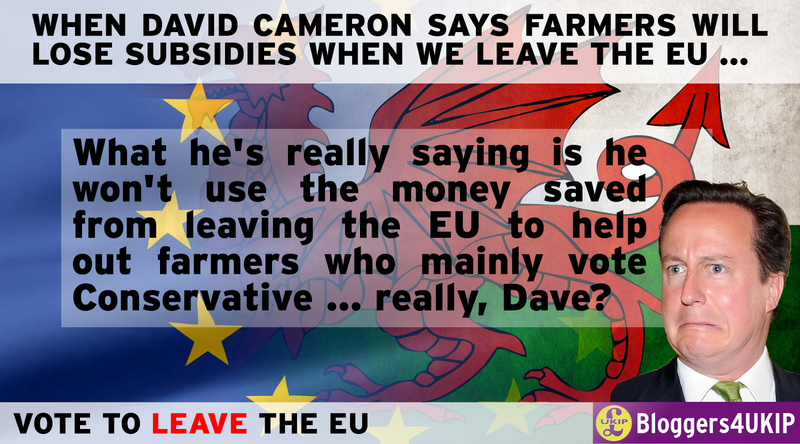 David Cameron has warned Welsh farmers that his government won't use any of the money saved from leaving the EU to subsidise farmers. Cameron has taken the Project Fear Tour to North Wales to warn farmers that leaving the EU will mean no more subsidies from the Common Agricultural Policy and increased costs and tariffs. We currently pay £55m a day into the EU and the cost to business and consumers of endless red tape and pointless regulations adds even more to the cost of being a member of their club. We pay £6bn a year into the Common Agricultural Policy budget and get £3bn of that back in subsidies. The British government could pay UK farmers the same amount they get in subsidies now for half the current cost and without burdening farmers with one-size-fits-all regulations that are applied equally to sheep farmers in Wales, olive growers in Italy and wheat farmers in Poland. The standard tariff applied to agricultural imports by the EU under WTO rules is, indeed, as high 40%. This is the rate applied for goods that aren't covered by a trade agreement. Would the EU choose not to conclude a free trade agreement with the fifth largest economy in the world and its largest export market in the two years between voting to leave and finally getting to throw off the shackles? Of course they would, it's inconceivable that they would damage their own economies just to punish us for leaving them. Research by the Bruges Group and published by the British government found that over 90% of our exports are tariff free and those tariffs that do remain are generally low or not collected because it costs more to collect them than the income they generate. The same research also found that 80% of trade in the UK economy is domestic, over 10% are exports to the rest of the world and less than 10% is to the EU. Things will change for farmers when we leave the EU but there is no reason to believe they will change for the worse. Cameron's threat that the Tories will abandon farmers is an empty one, the Tories rely on rural votes and donations from wealthy landowners like David Cameron's father-in-law.